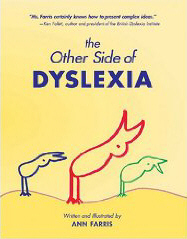 Book Review of Ann Farris’ The Other Side of Dyslexia. Ann was a director of the opera-musical theater program at the National Endowment for the Arts when she discovered she had Dyslexia. She writes in this book about her journey of self-discovery to being able to read. When I first opened the book, I was delighted by what I saw inside – unlike any other book, each page has colorful simple pictures with the words below. It conveys what she has in her mind: pictures and emotions; less words. My immediate thought was how authentic it is. To get into the mind of a person with learning disabilities, you must go beyond just words, as words have different meanings and understandings. Although in the main part of the book, Ann does not specifically describe the trainings and therapies that she has used to help her, she references them in the end. Anyone who would like to follow a similar path can. The journey included many therapies that I have used as well, including Brain Gym, Energy Medicine, eye exercises and watching diet. Yet for her, the emotional and spiritual journey helped unlock the physical stress that held her back. Today she is able to use words much better for both her reading and writing. This book was written primarily for dyslexics so that they can read about someone like them. She gives hints as to how to read it, and the print is big so that people can have an easier time with the words. It is also for the non-dyslexic to understand what can happen in the mind and body of another human. We are after all, unique. One thing I have learned is that we don’t know how other people see, hear or feel unless they tell us. Ann does an excellent job of that! I highly recommend this book to people who have learning disabilities as well as those who teach, care for, and love people with LD. Enjoy! The Roadmap from Learning Disabilities to Success! Kathy Johnson’s book The Roadmap from Learning Disabilities to Success is simple in form, short in length and long in information. Being challenged by both dyslexia and hpyerlexia I am not overly fond of reading. I do it, I can do it, but you don’t often find me choosing it. The format of Kathy’s book made reading the content easy. It’s as though she chose to present it for learning challenged adults reading skills. Kathy’s book succinctly describes success stories and provides a checklist for parents to consider. I find it interesting that she has made the links that I made as I progressed through my process of overcoming the negatives of dyslexia and many years later hyperlexia. At the outset she provides the order and importance of various approaches using a Pyramid of Potential. The base of the pyramid is Mind and Body. I too, through my own experimentation and with advice of others started my healing with these two topics. I was particularly excited to see how effective her work is with patient’s reflexes – those that normally develop while the baby is in utero and the first three years of life. I came across this technique shortly after I learned (six years ago) that I have hyperlexia. I had already taken the Lindamood-Bell verbalizing and visualizing process but it wasn’t until after a year a half of correcting my many reflexes that were under-developed did I find much more peace around the hyperlexia. I strongly support a parent having a child with learning challenges checked for the development of the child’s reflexes. Kathy’s Roadmap also gives good explanations of eye issues and has several useful suggestions on how to better eye problems. I loved her description of the use of a Brain Gym technique – lazy eights – a technique I have frequently implemented. As you can see I relate to Kathy’s work because her tools are many of the ones I have been fortunate to come across. The uniqueness of Kathy is that she has integrated them together and created a broad spectrum of skills to help her clients. It is this approach that she describes in her book, The Roadmap from Learning Disabilities to Success. I would recommend this book to any parent whose child has learning challenges.